A parallel plate capacitor has a capacitance of . If the plates are apart, what is the area of the plates? The relationship between capacitance, distance, and area is . We can rearrange this equation to solve for area. Now, we can use the values given in teh question to solve. Charge is distributed uniformly over the area of the two plates of a parallel plate capacitor, resulting in a surface area charge density of on the plates (the top plate is positive and the bottom is negative, as shown below). Each plate has area and are separated by distance . 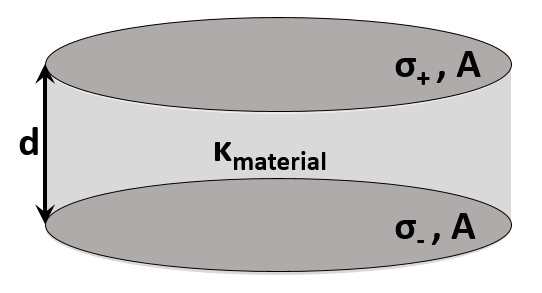 A material of dielectric constant has been placed between the two plates. Which of the following would not result in an increase in the measure of electric potential difference between the two plates? The area becomes inconsequential, while the potential is directly proportional to the surface charge density and the distance between the plates, and inversely proportional to the dielectric of the material between the plates. Changing the area does not cause any change in the potential difference measured between the plates, and changing any of the other variables would cause a resultant change in the potential difference. You are hired to make a capacitor out of two parallel metal sheets. If someone wanted you to make a thin capacitor of out of those metal sheets, and the sheets needed to be apart, what area do the two metal plates need to be? For parallel plate capacitors, the equation is . Now we can plug in our given values. The plates of a parallel plate capacitor are apart and in area. A potential difference of is applied across the capacitor. Find the capacitance. Capacitance is related to plate area and distance by the equation . Given the area and distance, we can solve for capacitance. The voltage, in this case, is irrelevant. The plates of a parallel plate capacitor are apart and in area. A potential difference of is applied across the capacitor. Compute the charge on each plate. Charge on a capacitor is given by the equation . We know that the voltage is , but we need to determine the capacitance based off of the area and distance between the plates. We can plug this value into the equation for charge. The plates of a parallel plate capacitor are apart. A potential difference of is applied across the capacitor. Compute the magnitude of the generated electric field. The electric field given by a capacitor is given by the formula . We do not have these variables, so we will have to adjust the equation. The capacitance can be determined by the area of the plates and the distance between them. This equation simplifies to , allowing us to solve using the values given in the question. If two identical parallel plate capacitors of capacitance are connected in series, which is true of the equivalent capacitance, ? This agrees with the general rule that the equivalent capacitance in series is less than the capacitance of any of the individual capacitors. Two parallel conducting plates each have an area of and are separated by a distance, . One plate has a charge evenly distributed across it, and the other has a charge of . A proton (charge ) is initially held near the positive plate, then released such that it accelerates towards the negative plate. How much kinetic energy has the proton gained in this process? According to the work-energy theorem, work done on the proton is equal to its change in kinetic energy. A and capacitor are connected in series with a battery. What is the magnitude of the charge on one plate of the capacitor? Capacitors in series always have the same charge on each unit, so the charge on the capacitor is also .